Scotch whisky blender Compass Box has released its new Affinity expression, a spirit drink comprised of Scotch whisky and Cavaldos. The Calvados, a cider-based spirit made mostly in Normandy from apples and pears, has been sourced from the region’s Christian Drouin distillery and blended with whiskies aged in French oak casks and Sherry butts. The blend includes malt whisky from Craigellachie alongside parcels of previously blended malts from Clynelish, Dailuaine and Teaninich distilleries. Compass Box founder and whisky maker John Glaser, said: ‘We have been blending Calvados with Scotch whisky at home and in our blending room for years, enchanted by their complementary qualities. Said to possess ‘a classic combination of flavours’ with ‘layers of apple character married beautifully with malty, vanilla and spice-like notes’, the spirit drink has been bottled at 46% abv. Compass Box Affinity is recommended to be served over ice, mixed with amaro and vermouth for a twist on the classic Boulevardier cocktail, or paired neat with tarte tatin. Only 6,028 bottles have been produced, available for purchase worldwide through specialist retailers and the Compass Box Whisky website priced at £100/US$150 per 75cl bottle. 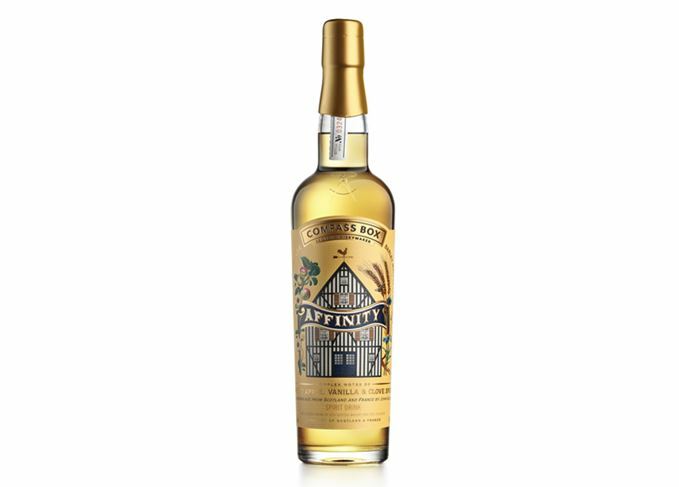 Compass Box Affinity is not the blender’s only spirit drink released in recent months. The experimental blending house unveiled Stranger and Stranger in December 2018, which could not legally be called Scotch whisky as 1% of its contents was aged for just 18 months. Regulations require Scotch whisky to be matured for a minimum of three years. An advocate for transparency in Scotch, Compass Box has published an online fact sheet listing the expression’s recipe in full. The new releases include ‘spirit drink’ Stranger & Stranger and blended malt whisky Juveniles. The new blended whisky marks the 25th anniversary of the Chicago punk rock whisky bar. Whisky Speed Dating reminds Becky Paskin why knowledge sharing is so vital in innovation. The releases include Phenomenology and No Name, the company’s peatiest whisky to date. The Double Single, the latest Compass Box release, consists of just one malt and one grain whisky.